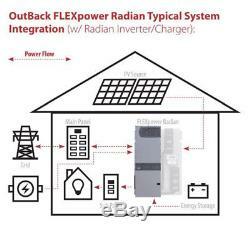 Outback GS8048A-01 Radian Series Grid/Hybrid Inverter/Charger 8KW 48VDC 120/240VAC. OutBack Powers acclaimed Radian Series made the benefits of Grid/Hybrid technology available and accessible in one agile powerful, platform ideal for nearly all off-grid or grid connected system architectures. The new Radian Series inherit the hallmark features of the original design, including: dual AC inputs for grid/generator flexibility with no external switching required, unparalleled surge capability and operational stability, easy field upgradeability and stacking capability for large system scaling, simplified system commissioning through a powerful, easy-to-use configuration wizard, and multi-mode operational flexibility. In addition, both models have a new Advanced Battery Charging (ABC) profile option to support leading-edge battery technologies such as Lithium-Ion and others, and enhanced diagnostics for improved performance. And both incorporate OutBacks GridZero technology, a superior level of intelligence in energy management for self-generation and self-consumption programs, providing precise balancing between using stored energy, solar and utility power, blending-in the latter to overcome surges and load spikes when needed. GridZero operation makes it possible for a smaller inverter and battery system to perform like a much larger one when required, putting stored and renewable energy sources to work and minimizing grid dependence. Both models also support AC-Coupling through a compatible OutBack load center to provide an economical solution for upgrading existing grid-tied systems to battery back-up capability. Complete system interfacing using the OutBack MATE3 and HUB communications manager enables the Radian to be connected with other OutBack Power electronics providing industry leading integration and a scalable power solution. Up to 10 units can be connected in parallel for systems up to 80kW continuous power output. 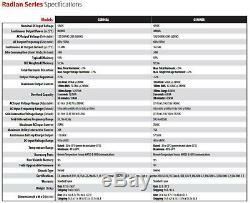 The GS8048A and GS4048A are certified to UL1741 for US applications, and CSA C22.2 No. 107.1 for Canada, and is IEC 62109-1 certified to meet the most stringent worldwide PV safety and emission standards. This product is for selected North, Central and Latin American markets. Grid-Interactive and Stand-Alone Capability in the same package. GridZero Technology Optimizes the Balance Between Stored and Renewable Energy Sources, Minimizing Grid Dependence. Advanced Battery Charging Profile (ABC) Supports Leading-Edge Battery Technologies Including Lithium-Ion. 8000W and 4000W of Continuous Power, Respectively. Field-Adjustable Input/Output Voltage and Frequency Boundaries of 50/60Hz, 170-280VAC L-L and 200-260V Nominal, Respectively. GS Load Center Option Allows for Quick and Easy Installation. Any product you return must be in the same condition you received it and in the original packaging. Outback Power RadianSeries GS8048A Inverter/Charger Advanced OutBack Powers acclaimed Radian Series made the benefits of Grid/Hybrid technology available and accessible in one agile powerful, platform ideal for nearly all off-grid or grid connected system architectures. This product is for selected North, Central and Latin American markets ---Grid-Interactive and Stand-Alone Capability in the same package ---GridZero Technology Optimizes the Balance Between Stored and Renewable Energy Sources, Minimizing Grid Dependence ---Advanced Battery Charging Profile (ABC) Supports Leading-Edge Battery Technologies Including Lithium-Ion ---8000W and 4000W of Continuous Power, Respectively ---Field-Adjustable Input/Output Voltage and Frequency Boundaries of 50/60Hz, 170-280VAC L-L and 200-260V Nominal, Respectively ---Unsurpassed Surge Capacity ---120/240V Split-Phase Voltage ---Dual AC Inputs ---Field Upgradeable Firmware ---Field Serviceable Modular Design ---Simplified Stacking Design ---GS Load Center Option Allows for Quick and Easy Installation. 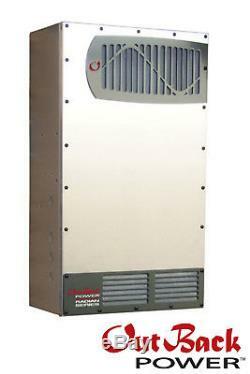 Outback GS8048A Radian Series Grid/Hybrid Inverter/Charger 8KW 48VDC 120/240VAC. The item "Outback GS8048A-01 Radian Grid/Hybrid Inverter/Charger 8KW 48VDC 120/240VAC" is in sale since Wednesday, September 6, 2017. This item is in the category "Home & Garden\Home Improvement\Electrical & Solar\Alternative & Solar Energy\Chargers & Inverters". The seller is "hurricanewindpowercom" and is located in Roanoke, Virginia.